The first Diablo III expansion, Reaper of Souls, just looted a March 25, 2014 release date. 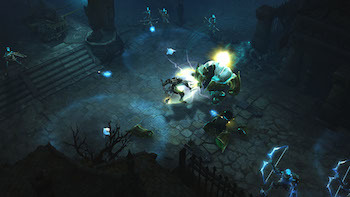 Diablo III: Reaper of Souls will be available March 25, 2014, Blizzard announced today on Battle.Net. The expansion, which adds a fifth act and the Crusader class, two new modes, and a long list of new loot, abilities and other fun stuff to keep players focused on their never-ending quest for loot. Now before you run out and pre-order it, you should know: There are a surprisingly large number of editions for Reaper of Souls, considering it's an expansion. The standard pack will run players $39.99, a more eager Diablo fan might be interested in the $59.99 Digital Deluxe Edition that includes the game, three additional character slots and a bunch of digital goodies, including in-game content like minions, a treasure goblin pet and decals for StarCraft 2. Players can pre-order Reaper of Souls starting today for both PC and Mac. Blizzard is currently running a closed beta for Diablo III: Reaper of Souls, which began earlier this month.